Bull Moose shot near a beaver pond. I carefully picked my way down the trail to the beaver dam. I had seen bull moose here before and was hoping to find one again. I was in luck. In the meadow to the left of the dam stood this bull moose. I settled my rifle down on a tree branch and took careful aim. As I squeezed the trigger the recoil knocked me. When I recovered the moose was gone. I thought I missed. I waited a few minutes to look all around to be sure the moose had not run behind some trees. I still could not see it. I left my spot and walked out toward where I had last seen him. When I arrived there I found some Moose hair and some drops of blood, this was a good sign. Now I just have to find him. I followed the blood drops for about 25 yards and there he was behind a big old cedar tree, he was dead. I guess when I shot I didn't see him run or go behind the tree. I'm sure glad I found him, he was certainly good to eat. I had to get the help from several hunting friends to get him out of the bush. Did you notice the cool drop tine? I did notice the drop tine. I have never seen one like that before. 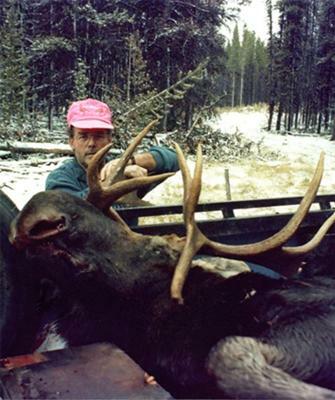 How much did your moose weigh? Great Story... Come back and share another.